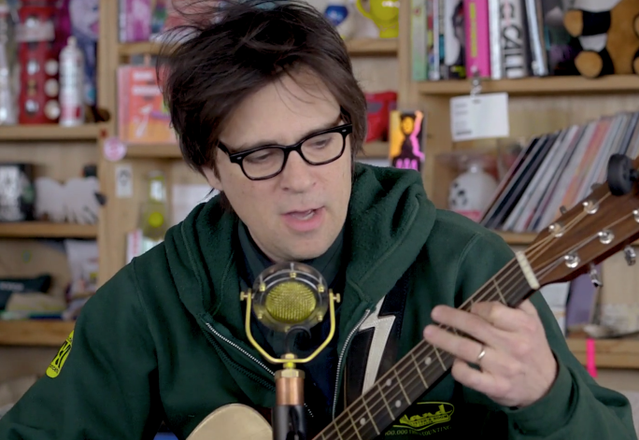 NPR’s Tiny Desk concert series has released their recent session with Weezer, celebrating the release of their new Black Album (read our review here). Performing without additional backing musicians, the band played a short acoustic set of songs from the band’s early and late career. They began with “Longtime Shine,” a 1994 original of Cuomo’s final heard on Pinkerton’s deluxe reissue, as well as two compilations of Cuomo’s solo recordings, before launching into “Living in L.A.,” a single from the Black Album. The set was rounded out with a pretty, stripped-back version of Pinkerton’s “Across the Sea,” followed by the Black Album’s “High as a Kite.” Cuomo, who was light on banter during the set ended with the signoff: “We are Weezer, from the planet Earth. Have a nice life.” Thanks, you normal man! Rivers Cuomo recently claimed the band was working on two new albums: a “shredding”-heavy rock album called Van Weezer (uh-oh!) and Okay Human, a stripped-down album based around piano and string orchestrations which was apparently inspired by Harry Nilsson’s esteemed 1970 album of Randy Newman covers, Nilsson Sings Newman. Prior to the Black Album’s release in March, Weezer released their covers-only Teal Album in January. Watch their Tiny Desk performance below.